Bellator Fighting Championships has confirmed several preliminary bouts for the promotion’s upcoming, October 15th event in Atlantic City, which will feature the semifinals of the ongoing middleweight tournament as well as an appearance from bantamweight champion Zach Makovsky. Bellator 54 will be hosted by Caesars in Atlantic City. The main card will be broadcast live on MTV 2 while the night’s preliminary action will be streamed on Spike.com. One of the preliminary bouts will see Daniel Gracie return to Bellator as a middleweight and face Duane Bastress. Gracie (5-3-1) hasn’t competed since March when he lost by split decision to light-heavyweight Tim Carpenter at Bellator 38. Bastress (3-1) has yet to compete in 2011; in the middleweight’s last bout in December, 2010, he was stopped by Tim Williams (via doctor stoppage) while competing for Locked in the Cage. Bellator has also confirmed several other preliminary bouts as Karl “Psycho” Amoussou will take on Joey Kirwan, the aforementioned Tim Carpenter will fight Jamall “The X Factor” Johnson, and Andria Caplan will meet Adrienne Seiber. The night will also include the semifinals of the promotion’s Season Five middleweight tournament, as Bryan Baker will battle Vitor Vianna and Brian Rogers will square off with Alexander Shlemenko. 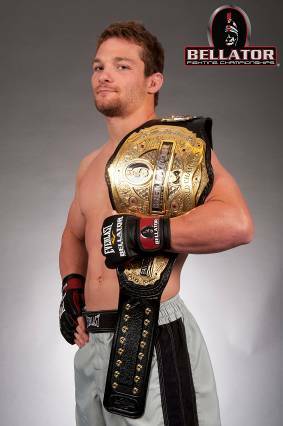 Bantamweight champion Zach Makovsky will also be in action and will fight UFC vet Ryan Roberts in a non-title affair.